Some of our fondest memories are connected to our lawns. It’s a great place to roughhouse with kids and dogs, entertain guests, or simply sit and enjoy life. To grow a beautiful lawn that you’ll be proud of, you need to develop a proper maintenance schedule which includes fertilization. Read on to find out about feeding lawns so yours will always look its best. All lawns need fertilizer in early spring when the grass begins to green up. Your fertilization schedule for the rest of the season depends on the type of grass in your lawn, the type of fertilizer you use, and your climate. Most lawn seed is a mixture of several different types of grasses, and both spring and fall fertilization are appropriate. The label on a bag of lawn fertilizer will recommend a schedule based on the type of fertilizer it contains. The label is your best guide to how often to apply the product and how much to use. As long as you don’t overdo it and avoid fertilizing in the hottest part of summer, your lawn should thrive. 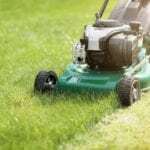 There are several ways to apply lawn fertilizer. Using a spreader provides more even coverage than fertilizing by hand. Hand fertilizing often results in burns where the fertilizer is concentrated and pale areas that don’t get as much fertilizer as they should. Broadcast or rotary spreaders are easy to use and don’t cause striping like drop spreaders. The advantage to drop spreaders is that there is no chance of overthrow getting fertilizer on streets, sidewalks or driveways. With a drop spreader, you have to make two trips over the lawn at right angles. For example, if you make your first trip over the lawn in a north-south direction, the second trip should run east to west. After applying the fertilizer, water the lawn thoroughly. Watering rinses the fertilizer off the grass blades so that they won’t burn, and it allows the fertilizer to sink down into the soil so it can get to work. Keep kids and pets off the lawn for the amount of time recommended on the label, which is usually 24 to 48 hours. Slow-release – You don’t have to use slow release fertilizers as often, but they are usually more expensive. Fast-release – You get quick results with a fast-release fertilizer, but you have to apply them in smaller amounts and more frequently. You can burn your lawn with a fast-release fertilizer if you use too much. Weed and feed – Try to identify your weeds before using a weed and feed product and make sure your weed is listed on the product label. Take special care around trees, shrubs and garden plants. Organic materials such as compost and manure – The essential nutrients aren’t as concentrated in these types of materials, so you have to use a lot. Compost or dry manure before applying it to the lawn, and be aware that some manures, particularly horse manure, may contain weed seeds. Liquid fertilizers – These aren’t recommended because they are hard to apply evenly and require frequent applications. Water the lawn a few days before you fertilize to make sure it isn’t suffering from drought stress. Make sure the grass blades are completely dry when you fertilize the lawn to avoid burns. Fill the spreader on the driveway or on cement so that you can sweep up spills easily.